Used Mazak CNC provides a search network for companies wishing to sell or buy used Mazak machine tools operating throughout Europe. Used Mazak CNC can offer market valuations of second hand Mazak machines for companies wishing to sell their goods free of charge. 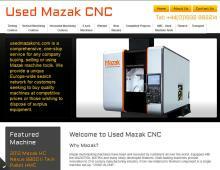 The only fee payable is when the item is actually sold by Used Mazak CNC. Used Mazak quality machines can normally be viewed on site as they are mostly operational to ensure they are suitable for customer’s specifications, technical suitability and to view the condition of the machines before they are purchased. Products in the turning centres range include Used Mazak Integrex machines, the leaders in multi tasking technology. Used Mazak machining centres to buy or for sale include both the vertical and horizontal machining centre ranges.